Undeniably sophisticated with enough casual flair to be low key too. 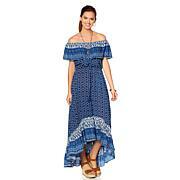 This dress gives you the range to move through seasons with an "it" set that's simply elegant and bohemian. Pull on a pair of boots for instant ease or tights and pumps for extra glam. I love this dress. Fits nicely looks amazing. Unique, stylish, and elegant dress that I purchased to wear to a beach wedding!I got the small - 5 4 ; weight 138 pounds. Fit slightly oversized but still looks great! Super nice. Well made. High quality &Beautiful. The slip is separate and is stretchy. It fits true to size. Will be wearing to a wedding in Hawaii. I think it will work beautifully. This is or should be a staple to anyones wardrobe. Its so gorgeous on, versatile, and adds a unique touch not only to ones outfit, but to your personality! I will treasure this one, as I will Cheryls entire collection, of which I now own a substantial ensable. Love this dress! 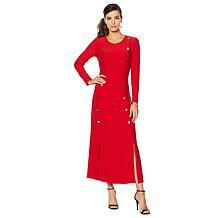 I am 62 and will be wearing this dress to a wedding in October. Fits perfectly on me. Size Med. I am 5'4" and 155 lbs. Got the black it is so well made. Never too old to wear pretty dresses! Not boxy at all!